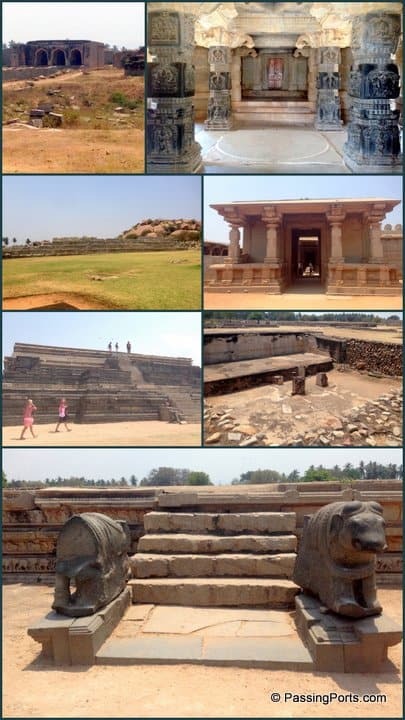 I’ll start off this post with a little bit of history before diving into things to do in Hampi. The Indus Valley Civilisation (also known as Harappan and Mohenjo-dharo) is one of the oldest civilisations where arts and crafts flourished. This period is also known for achieving accuracy in measuring length, mass, and time. 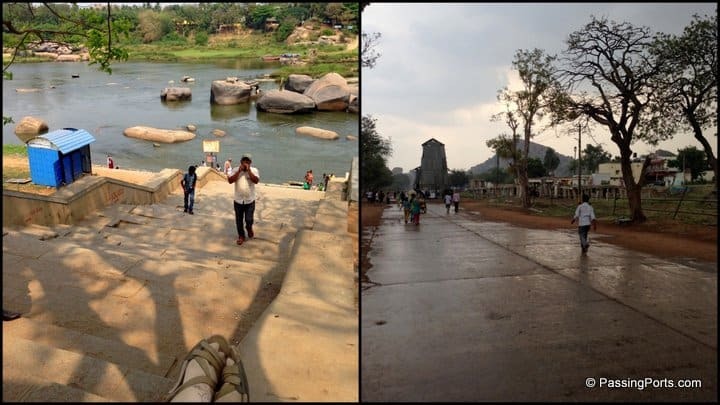 Zooming down to the southern part of India, let me introduce you to one of the northern cities of Karnataka, the place were Vijayanagara Dynasty once flourished. This is a hidden jewel among many cities in the country, a historian’s play ground, a dreamer’s paradise and definitely any photographers delight. Try talking to the locals there to know about Hampi and their faces starts glowing with pride. I sat with an old man who was running a small shop outside his house to get to know more about this place which in itself was an experience to me. For most of us, Google tells us everything but hearing it from someone who has been there, seen things and not moved on is more interesting and intriguing. 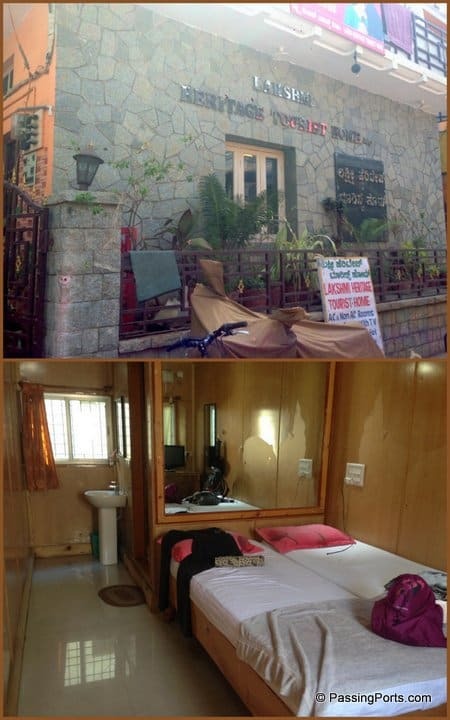 Accommodation in Hampi: Lakshmi Heritage run by Kiran. Please note that there are two sides of this city as River Tungabadra runs along with no road that connects the two. Locals and I (after staying there) suggest to stay on the side of the Virupaksha Temple. Coracles connect either side of the banks (till there is sunlight). Total Expense (end to end): Under Rs. 6000. 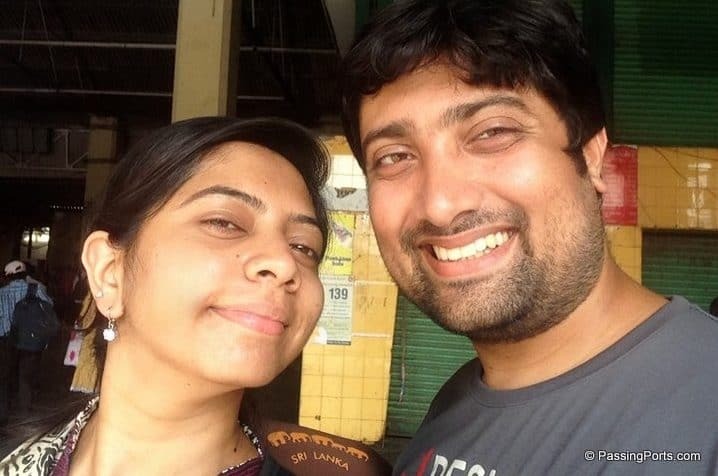 My concerned husband, Narayanan dropped me at the Chennai Central Railway Station. The next day, upon reaching Hospet, I had to walk a kilometre to get to the bus stand. Taxis and autowalas will all be waiting to greet you and offer a ride to Hampi. While I was walking to the bus station, I caught up with two other solo travellers from Hyderabad and Singapore. Ask the bus stand authorities to figure out which bus to take to Hampi. 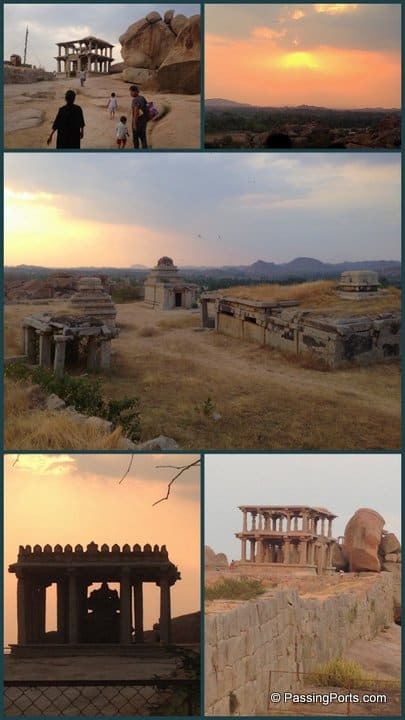 After a 45-60 minutes of travel, we reached Hampi. As this is a UNESCO World Heritage Site, the bus does not go into the city and also the roads here are really narrow – just the way it used to be years ago. 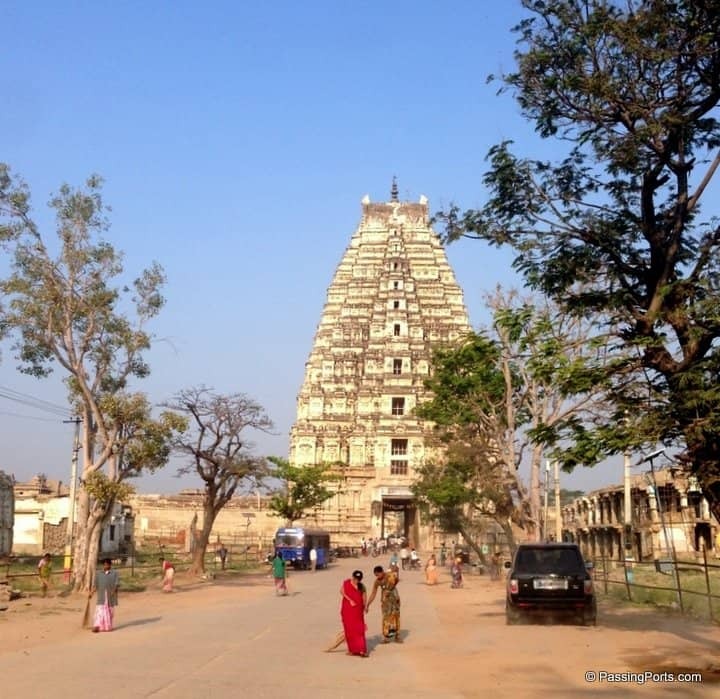 As soon as you get down from the bus, the first thing you will get to see if the famous Virupaksha Temple. One can write a post about the temple itself – its history and the stories around it are so fascinating. 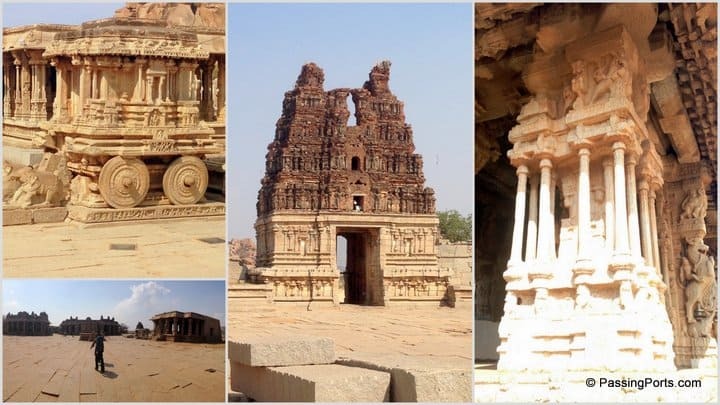 In short, on the banks of the river Tungabdra, Virupaksha Temple is one of the oldest functioning temples in India – been functioning since the time it was built. Both tourists and worshippers flock this place to visit Lord Shiva. 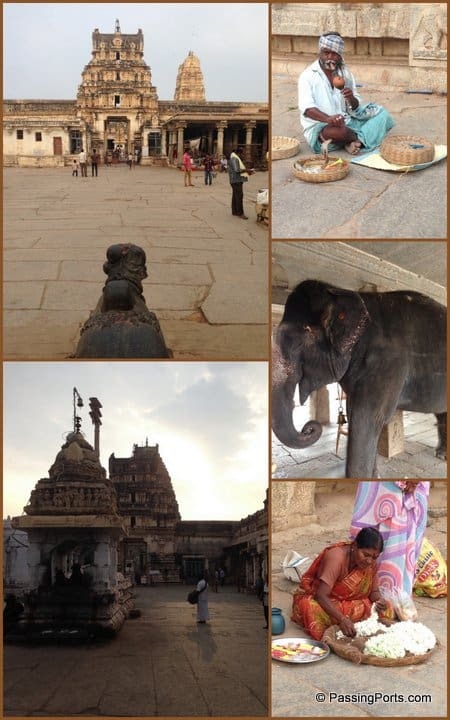 I went to the temple on the third day, before I bid adieu to Hampi, saving the best for the last. You cross the Virupaksha Temple to enter into this small city which practically has about four-five streets in all. We stopped at the most famous restaurant – Mango Tree for breakfast. As we got to know about each other, Boyang – the Singaporean and I had to say goodbye to the girl (I forgot her name :-/) who had booked a room on the other side of the river. 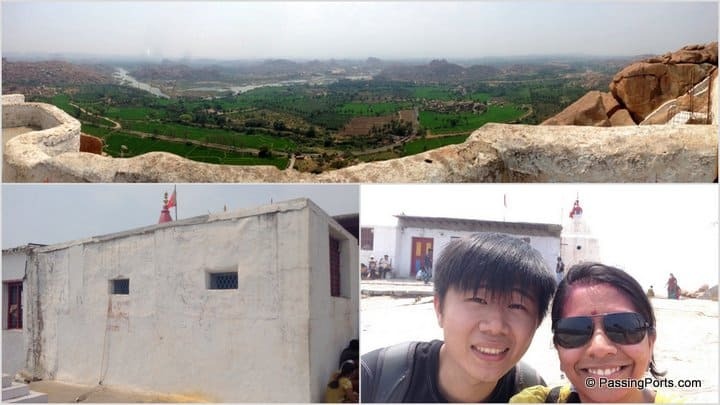 The two of us decided to explore Hampi together and headed to our respective hotels to freshen up and begin the exploration. We rented gear cycles from Lakshmi Heritage hotel itself (Rs. 500 for a day for each cycle) and started cycling around the city of ruins. 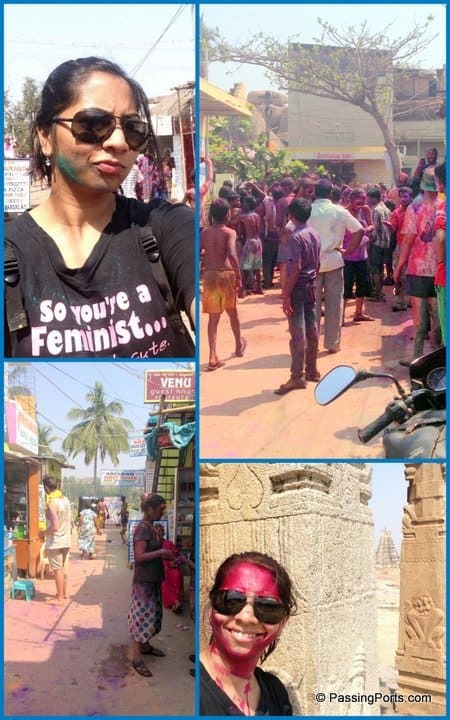 It was Holi that day and the celebrations were crazy. You will find maps that show you the route to take for visiting all the major attractions. 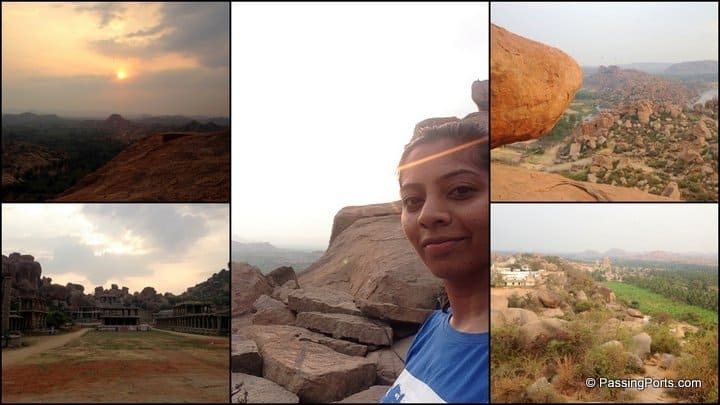 But every corner you turn, you will find something interesting 🙂 We started with the Ganesha Temple and followed the map to go to the other places. We covered Badavalinga temple, Lakshmi Narasimha Temple, Granaries, Elephant stables and many many many more. 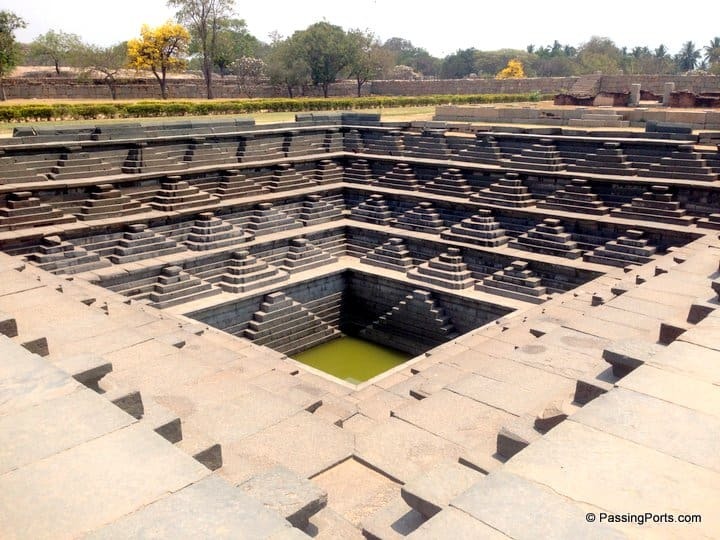 There is always some thing or rather one thing that attracts to me a particular place – and that one thing behind this trip was the step well tank called the Pushkarni. 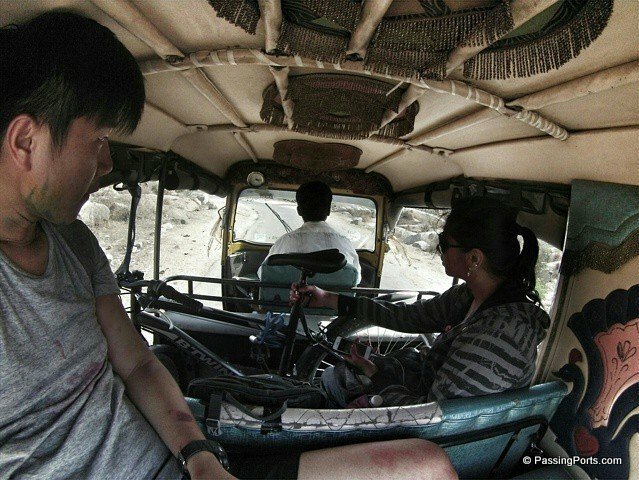 After this, we found a hotel called Tamarind Tree Food Point and stopped there for lunch. We were already tired by then as it was a really hot day and cycling did not help us much. 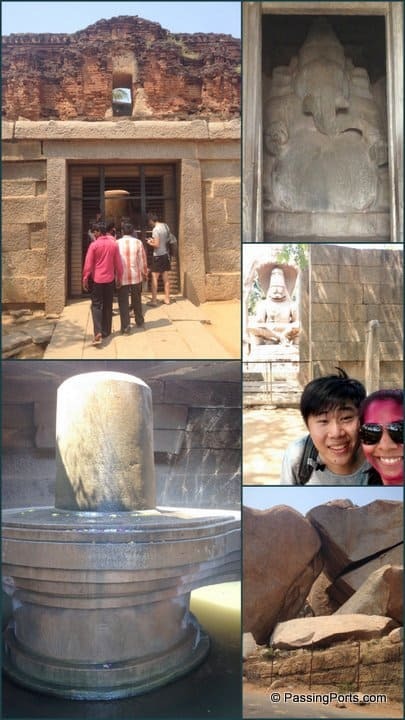 After relaxing for a while, we proceeded to the Vittala Temple – the architectural attraction of Hampi. This Vishnu Temple has the famous pillared halls with musical inscriptions and the Stone Chariot. You will be charged for entry to this temple – it is devoid of any idol and can be reached through two ways. This temple was one of a kind. We decided to take the coracle ride to the other side of the river to explore. We rented a bike once we reached the other side and started vrooming our way to see what was in store. The major attraction here is the Anjaneya Hill and Temple and so we went there. Note: Steep steps to reach the temple on top. Boyang had to leave to catch his train to his next destination, so we had lunch and returned to our side of the city. 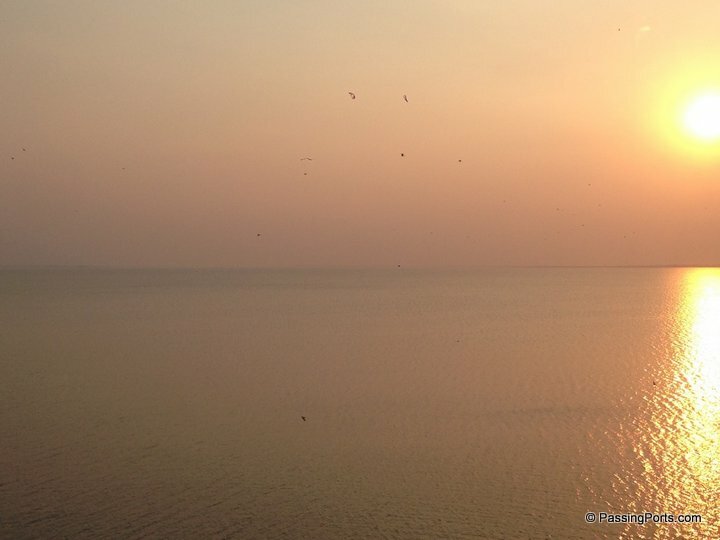 I decided to visit the Tungabadra Dam which is 20-25kms Hampi, 10-12 kms from Hospet. 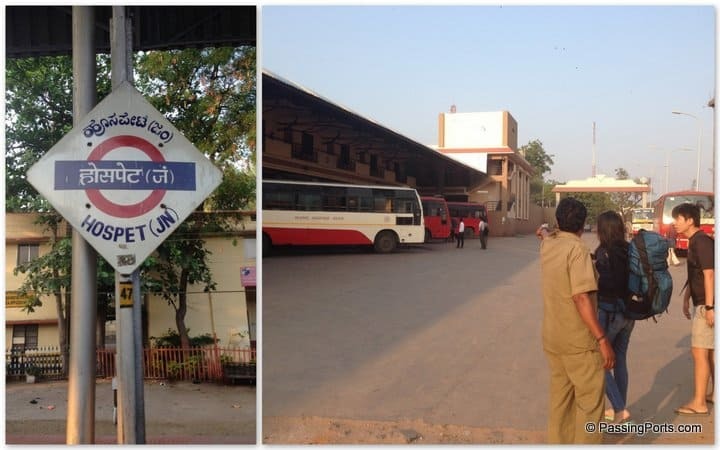 We took the bus back to Hospet. Boyang went to the railway station and I proceeded to the bus stop to go to Tungabadra Gardens and Dam. I spent a lot of time here until sunset (you can go all the way up which offers a great panoramic view). I also watched the musical fountain show (which can be skipped) in the gardens along with a lot of mosquitoes. Later I took an auto to Hospet (it was around 0730 PM) and another auto from there to Hampi as I had missed the last bus. After reaching at about 0900 PM, I had dinner and spent some time talking with the guys in Gopi Restaurant. Next day morning, woke up at 0630 AM to climb the Matanga Hill. Missed the sunrise, but still the views were stunning. I was so happy that I pushed myself to wake up to go there that morning. What was surprising is that families (young and old) climb this hill. I think this is a tad bit difficult a climb but guess nothing stops people when they are a wanderlust. Before I left the city to catch my train back to Chennai, I spent a lot of time sitting on the banks doing nothing but watching kids swim, people busy making plans of all sorts and realizing that life is so beautiful. Mykonos - To Miss Or Not! Valparai - A Less Known Hill Station In Tamil Nadu.